I’ve had my 2002 Honda Reflex scooter for many years. It tends to sit a lot in the garage, and I go through only about 2 tanks of gas a year, so lots of gunk probably builds up in the fuel system. One problem that I’ve always had, but never bothered to fix is that if it sat a long time, it would start cold OK and idle, but then when I tried to open the throttle, it would stall. The worst thing I could do is open up the throttle wide while this was happening… it seems like it would flood the engine, because it would stall, and then become hard to start for a while. Usually, running it for a few minutes and letting it warm up a bit would get it going enough that I could finally rev it up. If I managed to get it to rev w/o stalling just once, then it would run perfectly after that. The above problem would happen only if I let the bike sit for several weeks w/o riding it. Otherwise, it would cold start OK, and no problem with it stalling on initial rev up. For the last 3 times I’ve ridden it, the problem has gotten a lot worse. I always have to use starter fluid to get it running. Then it idles fine, but stalls instantly when I try to rev it, just like before. But the difference is that now, I have to run it forever before I can rev it without stalling. And even if I manage to get it to rev to say 4000RPM and hold it there a while, when I let it go back to idle, then it goes back to stalling when I try to rev it. This is different from before, in the past, because holding it at 4000RPM for a few seconds just once would fix the stalling when attempting it to rev. Furthermore, now, I have to ride it without stopping for a few miles, or it will again stall when I try to rev it up. Also, there is a bit of hesitation when I start of from a traffic light. After doing some research on the Internet, I guessed that the problem had something to do with the starting enrichment circuit. Rather than a choke, the Reflex has a starting enrichment valve which blocks a jet that lets in a bit of air when the engine is cold. This causes it to run rich, so functions a bit like a choke. Working on the Reflex’s engine is generally a pain, because it takes so long to take off all the panels to get access to it. To my delight, I discovered that the starting enrichment valve is accessible if you remove the plastic battery cover under the seat. 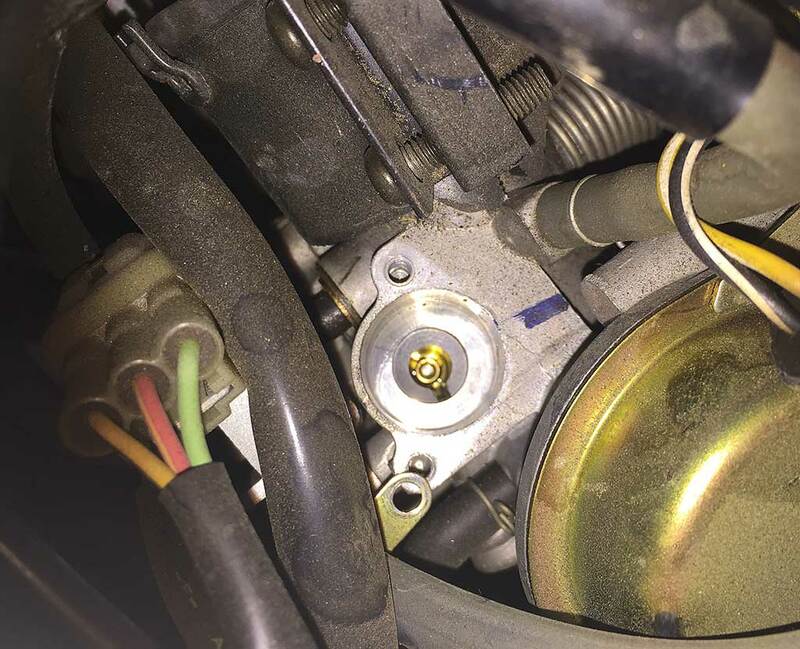 Next to the battery is an access hole to the engine, which gives you peek at the top of the carburetor. It’s held on by two screws, one of which is circled in red in the photo above. The other one is impossible to photograph, but it’s in the vicinity of where the red arrow points. 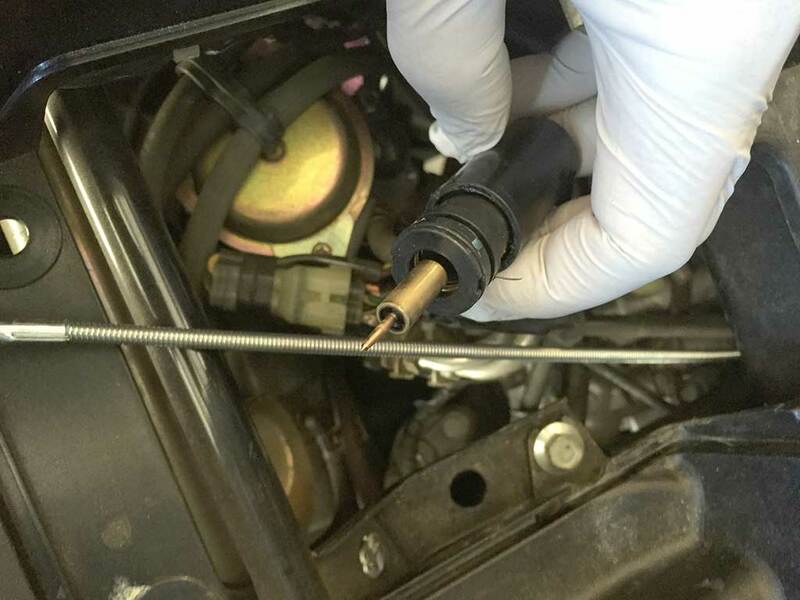 Make sure to use a strongly magnetized philips screwdriver to remove the screws, to help avoid dropping them into the dark netherworld of the engine compartment. The clip in the photo below is clamped down by the two screws, and it in turn holds the starting enrichment valve in place. Once the clip is removed, the valve simply lifts out. Mine was moving freely, and looked fairly clean. I didn’t bother testing it it, since my problem is with cold running. The valve is fully extended by default, which blocks an orifice that lets air in, so the engine runs rich. As the engine warms up, the valve is supposed to retract, letting more air into the engine, leaning out the mixture. Reinstallation of the starting enrichment valve is just the reverse of the removal. The procedure takes about 3x as long as removing it, especially when your screwdriver slips into the bowels of the engine, and you have to locate it and fish it out. I magnetized the screws to make them stick better to my screwdriver before very carefully putting them back in. After I put everything back together, the bike started up without start fluid, so cleaning the valve & jet definitely helped a bit, but I still had to warm it up for several minutes before I could open the throttle without stalling. So I only fixed part of the problem. I guess the other jets in the carburetor are still clogged up. I headed out and bought some fuel injector cleaner. After pouring a couple of tablespoonsful into my tank, I added a gallon of gas, and took it on a 10 mile ride. It’s already running smoother, and no longer hesitates when I start off from a traffic light. I’m eager to see how it behaves next time I do a cold start. If the problem still doesn’t clear up after running the gallon of gas through the engine, I guess I’ll have to remove the carb and do a proper cleaning on it… something I’m not looking forward to. Access to the carb will require removing a lot of panels. 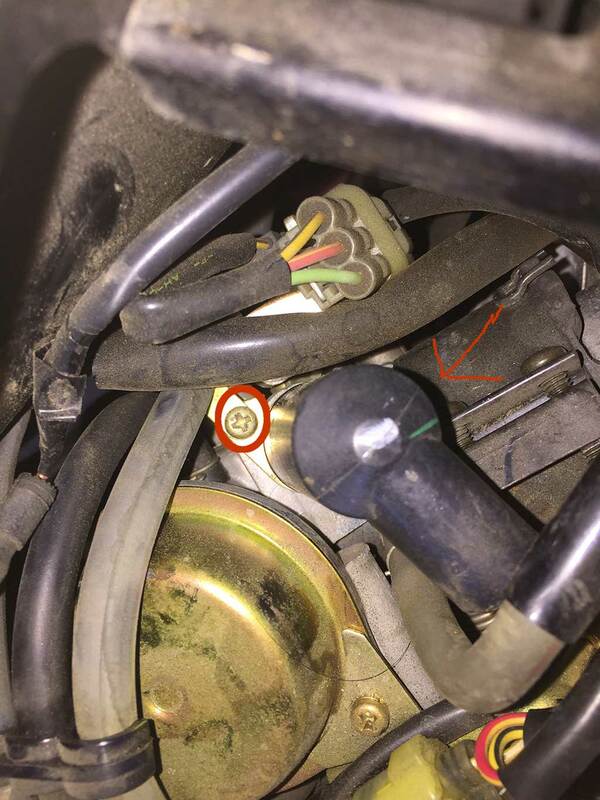 There are 3 Comments to "2002 Honda Reflex R&R Starting Enrichment Valve DIY"
My 07 Reflex starts & idles fine but stalls upon opening the throttle. 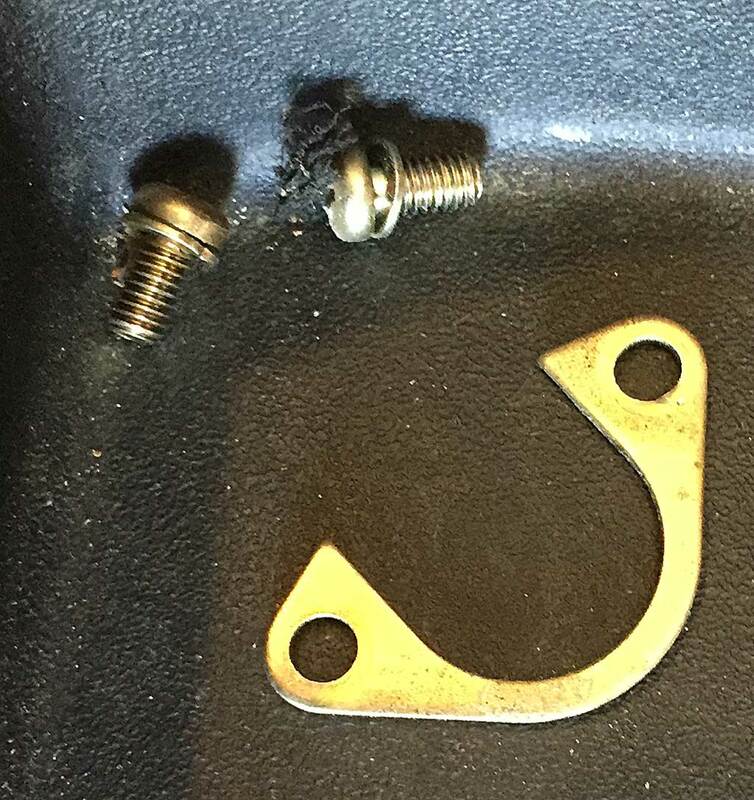 I had the carb removed and cleaned, which solved the problem for a short time. Problem of stalling when cold is back. Do I need a new SE valve? Mine still does the same thing sometimes. when it’s very cold outside, especially if I haven’t ridden it in a while. I don’t know if it’s related to the SE valve. You should try taking yours out and testing/cleaning it. Another thing that helped, but didn’t completely solve it was running the tank down until most of my old gas was used up, refilling it up half way, and putting in a bottle of Techron. It’ll fart & belch and run badly with such a high concentration of Techron, but after running that tank down and refilling w/ fresh gas, it’s having less trouble w/ cold stalling. You might try posting a message on the Yahoo reflex rider’s group, to see if anyone is more knowledgeable about the exact cause. If you find a solution, please post back here. Thanks. I forgot to mention that the service manual notes a SE. Maybe this is stuck in the OPEN position for the SE valve? ?